1 passes to 3 looks for give and go. 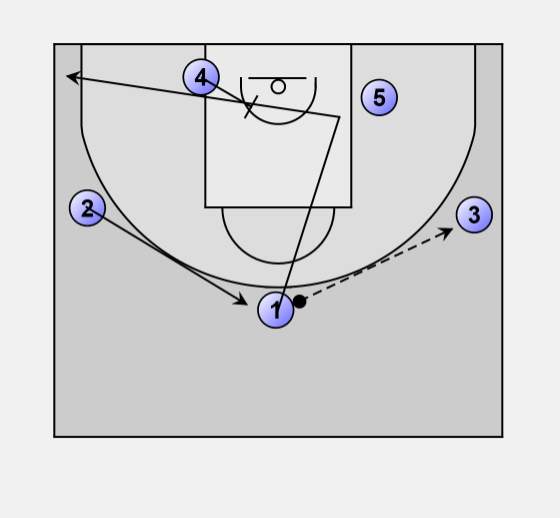 If Give and Go is not their, he continues to the corner using a screen from 4. If 1 is a good shooter, then 3 can pass to 2, and 2 passes to 1, you have an open jump shot in the corner. Players may not repeat the offense if ball is deep in the corner. Possible trap from 4 & 5 Defenders. 1 looks for give and go. 5 should give him some space. If defender sags off 5, you might be lucky to have a midrange shooter. 3 looks for 5 in the post. 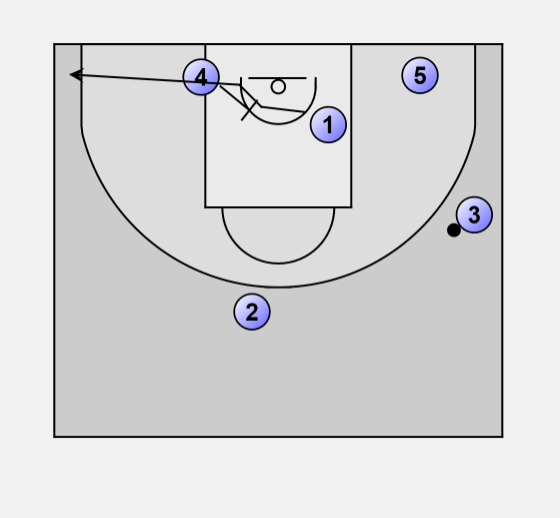 If 5 cannot receive a post feed then he sets up 4 to come through and see if he can retrieve a pass in the post. 1 comes in for a better passing angle. **If 1 is your top shooter, you can have 2 go screen 1 and retrieve the ball at the point. This will also keep the defense busy. **If 1 was screened by 2 then you have the original formation with just 5 and 4 switched. 2 Low post players who are weak working the perimeter. The more perimeter shooters the more effective the low post screens will work. Tell your players, look for the give and Go, and then 2 different post passes. Then Reset. Also when the give and go occurs, the post player who is on the balls side should give his player some room to run through. If he has a midrange jumper then the cutter only has to worry about his defender.